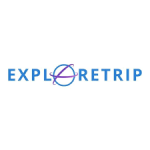 Explore Trip is a travel website offering cheap flights to and from anywhere in the world. The company has a Price Meet or Beat guarantee. Travelers can explore bargain fares. The aggregator site checks out hundreds of airlines and other service providers to list the least expensive airfares. There is a deal analyzer tool on the site with an integrated price indicator to help flyers find the best fares. Over five hundred airlines find representation on the site. The company offers safe online bookings and there is reliable round the clock support. Explore Trip is rated A by the Better Business Bureau.